In a Mustamäe coppice Eli found and photographed quite large leaves. 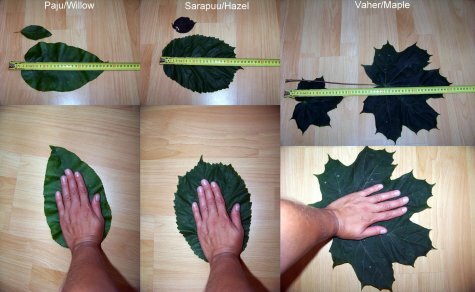 In general the number of cells in organs is fixed: a small as well as a big leaf consists of roughly the same number of cells. All the cells are already in place in the opening bud and only a growth in cell size takes place. Growth conditions determine how large each cell grows. Leaves on shoots from tree stumps are for instance especially large: the root system offers excellent nourishing and the removed crown no longer shuts off the necessary light. In good growing conditions even the arrangement of leaves can change: on lilacs, ashes, maples I have seen leaves set in whorls of three instead of the usual opposite arrangement; on pines three-needle groups can be found. Growth can be limited too. In poor growing conditions the plant develops into a dwarf; so for instance a some twenty years old spruce in a spring fen is only half a metre high.